The Dallas Fort Worth CBS Local website posted an article on “Best Table Side Restaurant Preparations In DFW” Japanese Palace was listed as a great destination for table side food preparation that is returning to popularity as a part of the dining experience. 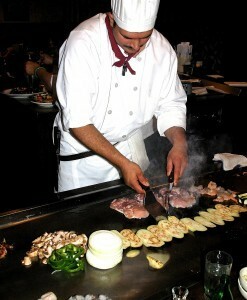 If you want to experience a great example of table side food preparation visit the Japanese Palace in Fort Worth for one of our great Teppanyaki or Teriyaki dishes that are prepared in front of you on one of our hibachi grill tables. Don’t forget to signup for newsletter and receive a free appetizer and other great deals from the Japanese Palace.